Edema is the medical term for swelling caused by excess fluid or blood accumulated in the body’s tissues due to inflammation or injury. What is weeping edema? It is the term used when there is constant fluid leakage that occurs in any part of the body, such as the feet, ankles, hands, face, eyes, and brain. 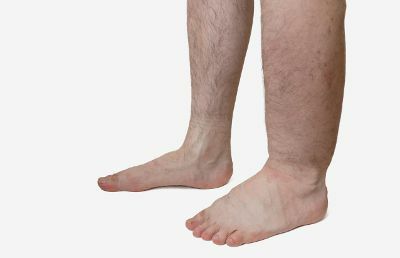 Weeping edema in legs and arms is most common, while there is a prominent connection between weeping legs and diabetes. Weeping edema can happen to anyone, but is particularly common in elderly and pregnant women. Fluid leaking from legs in elderly patients especially can be a sign of a more serious underlying health problem, including kidney damage, cirrhosis, congestive heart failure, and weakness or damage to veins in the legs. Fluid leakage can also result from failure of the lymphatic drainage system (lymphedema), low or high blood pressure, large wounds or other skin conditions, head injuries or brain tumors, and a number of medications. Symptoms of edema will depend on the amount of swelling, and where it occurs in the body. This article will take a deeper look at edema symptoms and complications, as well as more detail about weeping edema causes. This will include some of the mild causes like prolonged sitting or standing, and how specific medications and diseases can cause edema. We will also examine the connection between weeping legs and diabetes, and learn about how to prevent and treat weeping edema naturally. Edema occurs when fluid leaks from the tiny blood vessels in your body. Weeping legs in elderly, pregnant women, and other people has a number of interesting causes. This section will examine the different weeping edema causes that may be mild, more severe, or occur as a symptom of medications. Eating too much salty food: The kidneys control the amount of salt in the body when salt is excreted through urination. The body retains salt, which leads to swelling and water retention, when the kidneys aren’t working properly due to heart problems or kidney disease. This is why reducing sodium intake is a good idea when edema is an issue. Sitting or standing from long periods of time: Standing or sitting in the same position for too long, especially in hot weather, can reduce blood circulation, which can cause swollen legs, feet, and ankles. Women’s health: Pregnancy can cause weeping edema in legs since the uterus puts pressure on a major blood vessel called the vena cava, which is responsible for moving blood from the legs to the heart. Preeclampsia is a more serious cause of edema during pregnancy. Having premenstrual symptoms can also cause swelling. Edema can also be a side effect of certain drugs. This is because drugs can cause the body’s water and sodium levels to become unbalanced. The excess sodium or water levels may also contribute to kidney dysfunction. When medications cause swelling, it is often mild edema in the legs. A number of health conditions, diseases, or situations may also cause edema. Inflammation: Tissue inflammation may cause swelling in the legs. Inflammation may also be due to an infection, allergies, or trauma such as a sprained ankle or broken bone. Weeping legs cellulitis, gout, or arthritis can also result from an infection or wound. Low protein levels in blood: Low albumin protein levels contribute to edema, especially in the lower legs, ankles, and feet. Fluid will leak from the blood vessels and cause swelling when albumin levels are low. This is because albumin acts similar to a sponge in the blood. Congestive heart failure: Congestive heart failure occurs when one or both of the heart’s lower chambers fail to effectively pump blood. As a result, fluid or water seeping from legs, feet, ankles, abdomen, and other areas of the body will manifest. Lung conditions: Congestive heart failure can sometimes cause fluid accumulation in the lungs—also called pulmonary edema. This can lead to shortness of breath. Edema can also result from other serious lung conditions like pulmonary fibrosis or emphysema. Kidney diseases: When the kidneys fail to remove enough water and sodium from the body, pressure is put on the blood vessels, and this can lead to edema. Edema linked to kidney disease often happens around the eyes and in the legs. A kidney disorder called nephrotic syndrome is also known to cause severe leg edema, and even edema throughout the entire body. Lymphedema: Lymphedema is damage to the lymphatic system wherein the body cannot properly drain fluids, which can lead to non-pitting edema in the legs or arms. Lymphatic system problems can occur from venous insufficiency, obesity, radiation therapy, a mastectomy, and lymph node surgery. Liver disease: Liver disease can cause ascites—also called edema in the abdomen. Ascites occurs from liver conditions like cirrhosis when protein levels become too low, which leads to liver congestion. Pressure in the blood vessels will allow fluids to then seep into the abdomen, and cause abdominal swelling and leg edema. Vein problems: Venous insufficiency is when your veins are unable to transport enough blood to the feet and later to the heart. As a result, your legs, feet, and ankles become swollen. Edema is also a sign of thrombosis due to slow-flowing blood, which can cause a blood clot. Varicose veins are another edema cause due to blood flow slowing down or blood pooling in the legs. Head trauma: Various types of head trauma can also cause edema, including exposure to high altitudes, low blood sodium, brain tumors, and fluid drainage blockage in the brain. Confusion, headaches, comas, and unconsciousness can also create edema. Those living with diabetes for many years should be aware of the health risks associated with the condition. This section will explain the link between weeping legs and diabetes. Among the complications associated with diabetes is swelling in the lower leg. This is due to diabetes expanding blood circulation in an inappropriate way. A case study published out of Germany in 2005 found that a patient with diabetes also had signs of muscular weakness and leg edema, which had not responded to previous treatment. Diabetic neuropathy is a nervous disorder caused by diabetes. This can lead to numbness in the feet and legs, and the person may be unable to feel pain from an injury like a fracture or sprain. Swelling is a serious side effect of diabetic neuropathy. Macular edema refers to when swelling results from fluid filling the macular tissue that is near the retina of the eye. This eye swelling is caused by diabetic retinopathy—a complication of diabetes that can lead to vision loss and eventual blindness. In diabetic macula edema, the fluid accumulation is due to leaking capillaries. Gestational diabetes is a unique type of diabetes that is only a problem for pregnant women, and it disappears once the baby has been born. Leg swelling is often linked to gestational diabetes; however, the pregnancy itself can also lead to the accumulated fluids in the legs that cause the swelling. Foot and leg edema are also caused by major risk factors of diabetes, such as cardiovascular disease and hypertension. About 75% of adults with diabetes have high blood pressure. Also, adults with diabetes have two to four times higher death rates from cardiovascular disease than adults without diabetes. Lymphedema is another complication of diabetes. Since immunity is compromised in lymphedema patients, this increases the risk of swollen limb infections. Lymphedema risk doubles in diabetics because wounds have a harder time healing. Research shows that diabetic medicine like insulin can induce edema in the lower extremities around one week after initial treatment. Besides insulin, leg swelling can also be caused by medications called thiazolidinediones, which are often prescribed for type 2 diabetes. Consult with your doctor if leg edema is severe. He or she may be able to change your prescription to help relieve you from the swelling in your legs. Pulmonary edema may also be due to diabetic medications. It is common for diabetics to have low immunity toward infections; therefore, leg swelling can also be a sign of an infection. Redness and a mild fever are other symptoms of an infection. The symptoms of weeping edema will depend on the location and the amount of swelling. In general, you will experience weeping edema in arms, legs, ankles, hands, feet, face, and even the brain. However, edema from an infection or inflammation may cause no symptoms. On the other hand, pain, tension, warmth, tight skin, and limited joint movement may result from edema due to an allergic reaction. Allergic reactions and food allergies may also cause throat or tongue swelling, which may be life-threatening if it interferes with breathing. Edema can also lead to leg heaviness, and this can also affect walking. Additionally, severe leg edema can also interfere with blood flow, and eventually skin ulcers. Edema can also affect the lungs, and may cause coughing, skin pallor, and shortness of breath. In gastrointestinal-related edema, abdominal swelling will also occur, often due to cirrhosis and bleeding ulcers. Weight gain also occurs from edema due fluid build-up in the body. For instance, each leg may weigh up to 10 extra pounds. Other general symptoms of edema will include puffiness of the tissue under the skin, increased abdominal size, and skin that retains pits after being pressed for several seconds. When left untreated, weeping edema complications can also include reduced blood circulation; scarring between layers of tissue; increased risk of infection in the swollen area; stretched or shiny skin that becomes uncomfortably itchy; and a decreased elasticity of the veins, arteries, muscles, and joints. Is it possible to prevent weeping edema? It is important to first prevent the cause behind the various types of edema. For instance, quitting smoking will help prevent edema due to lung problems. Also, if you manage your diabetes properly, you can help prevent edema due to diabetic-related issues and complications like lymphedema, diabetic neuropathy, and diabetic retinopathy. Congestive heart failure is often caused by excessive alcohol intake and hypertension. Limiting your alcohol consumption can help prevent high blood pressure and congestive heart failure. In general, it is a good idea to stand up often and walk around to avoid leg swelling during long trips. Try to get up every hour. If that is not possible, exercise your lower legs and feet when seated. This exercise will help the veins move blood toward your heart. Weeping edema wound care treatment will include using compression bandages and pressure sleeves that tighten over swollen limbs. This forces the body to reabsorb the leaking fluid. Your doctor may also prescribe diuretics and medications for the underlying cause of edema. Surgery might also be necessary to remove fluid and fat deposits linked to an edema called lipedema. Furthermore, you may require surgery to repair damaged lymphatic glands or veins to improve blood and lymph flow. Since retaining salt leads to water retention and swelling, people prone to edema should lower their consumption of sodium-rich foods like olives, table salt, bacon, and processed and packaged foods. Instead, consume lean protein and natural diuretic vegetables, including parsley, asparagus, leaky greens, beets, garlic, leeks, onion, and pineapple. Dandelion root is a natural diuretic that allows the liver to eliminate toxins that cause inflammation. For dandelion tea, steep the root for 30 minutes in boiling water. Strain the dandelion, and the tea is ready. You need to move and stay active to keep bodily fluids pumping to your heart. If you work at a desk all day, take frequent breaks and walk around a bit to keep the blood flowing in your legs. Try to move around five to eight times daily. Gentle massage promotes blood flow to the heart, and can remove pressure on the blood vessels that may cause swelling. Massage therapy is recommended for less severe edema due to water retention. A study published in the International Journal of Nursing Practice in 2010 found that a 20-minute foot massage treatment had significantly reduced lower leg edema in late pregnancy after five days. For reducing water retention in the legs, elevate your affected area a few times daily to help relieve pressure. This can be very helpful for pregnant women experiencing swollen feet, ankles, and legs. Simply place your feet under some pillows for 15 to 30 minutes. Certain essential oils like fennel oil and grapefruit oil may work as natural diuretics by reducing inflammation and water retention. The essential oils can also stimulate blood circulation, increase blood flow, and relieve swelling due to edema. Combine three to four drops of grapefruit oil or fennel oil with one teaspoon of carrier oil like coconut oil or jojoba oil. Massage the affected area two to three times daily until the swelling has gone down. Weeping edema is swelling due to constant fluid leakage in any part of the body, including the arms, legs, eyes, face, hands, feet, ankles, and brain. The symptom is caused by a variety of factors, including standing or sitting for long periods, pregnancy, or eating salty foods. It can also be caused by something more serious, like congestive heart failure, lung conditions, liver disease, and kidney diseases. There is also a connection between weeping legs and diabetes. Natural treatment for weeping edema will include elevating the affected area and moving on a regular basis. Other helpful treatments include using essential oils like fennel oil and grapefruit oil, drinking dandelion tea, getting massage therapy, and eating a low-salt diet. “Edema,” Harvard Health Publishing, https://www.health.harvard.edu/diseases-and-conditions/edema-, last accessed Jan. 25, 2018. “Edema,” Mayo Clinic; https://www.mayoclinic.org/diseases-conditions/edema/symptoms-causes/syc-20366493, last accessed Jan. 25, 2018. Kaizu, K., et al., “[Drug-induced edema],” Japanese Journal of Clinical Medicine, January 2005; 63(1): 102-106, PMID: 15675326. Jacobs, B., et al., [Diabetes mellitus and massive lower leg edema without heart failure],” Deutsche Medizinische Wochenschrift, April 29, 2005; 130(17): 1074-1077, doi: 10.1055/s-2005-866791. Nijat Bas, V., et al., “Insulin Oedema in Newly Diagnosed Type 1 Diabetes Mellitus,” Journal of Clinical Research Pediatric Endocrinology, March 2010; 2(1): 46-48, doi: 10.4274/jcrpe.v2i1.46. “What Is Edema?” WebMD; https://www.webmd.com/heart-disease/heart-failure/edema-overview#1, last accessed Jan. 25,2 018. “Edema,” University of Maryland Medical Center; https://www.umm.edu/health/medical/altmed/condition/edema, last accessed Jan. 25, 2018. Coban, A., et al., “Effect of foot massage to decrease physiological lower leg oedema in late pregnancy: a randomized controlled trial in Turkey,” International Journal of Nursing Practice, Oct. 2010; 16(5): 454-460, doi: 10.1111/j.1440-172X.2010.01869.x.